Okay, fair warning that is a post related to the big sporting event this weekend. However, this is an appetizer that ultimately will please any palate, I promise. If sports isn’t your thing, no problem. Do yourself a favor, give this recipe a chance because we are talking about wings!! Oh yeah! This is one of the most recognizable foods you can find anywhere. Happy hour, hour of the big game or just snack hour, these little beauties will fit the bill. To prove my point, here is the finished photo of what you could be enjoying. The best thing about these wings is the flavor profile is rather unique and can really deliver that wow factor. They are tangy, sweet, citrusy, and a balanced punch of salt. In addition, making these wings is so, so simple. Marinate and cook. Done. That is it, for real. Ready? Let’s get it! This is a recipe that I have adapted. So, if you want to see the recipe in all of it’s glory, here is the original. In a bowl, combine the first 5 ingredients. Stir the mixture until the sugar dissolves. Add the wings into a resealable plastic bag and pour in the mixture, make sure the bag is sealed, and toss the wings until they are all coated. Let the wings marinate for as little as two hours or let them go overnight. Fire up your favorite grill and cook. This will take about 15 to 20 minutes or until the wings are cooked through. 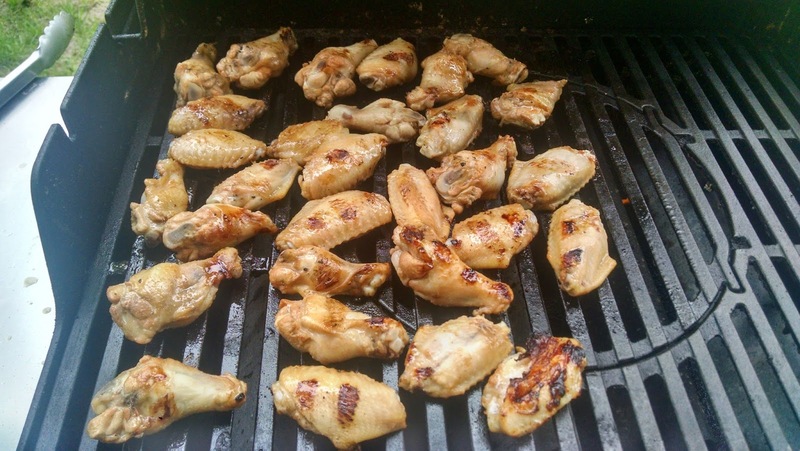 Be sure to turn these wings frequently because the sugars will carmelize and you can burn these wings easily. If you prefer to cook these in your oven, place the wings on a foil covered baking sheet and set your oven to 400 degrees. This will take between 45 minutes to 60 minutes depending on your oven. Again, same rule applies, check on these frequently so your wings don’t get too dark. If you are worried they are getting dark just throw another sheet of foil over the wings. This will keep them from burning, but still allow them to cook through. Trust me, it works really well as I have been there. After that, well, serve with your favorite condiment and enjoy! May I suggest some homemade barbecue sauce. If you are more classic and would like a homemade ranch dressing, then you can find that too. I have made a few changes relating to the ingredients on this list. First, I use a little less soy sauce because of the amount of salt in it. Even if you use the low sodium soy sauce the salt can add up quickly. I normally start with 2 tablespoons and then I adjust accordingly. Also, I start with less sugar to keep the wings from getting burnt and I really love the punch of the lemon juice and find I don’t miss the sugar. You can always add, but it doesn’t work so well to take stuff out of the mix. If you want a little spice add a little chili powder or chili flake to give these some heat. You can always taste the marinade before you add the chicken and I highly recommend it! 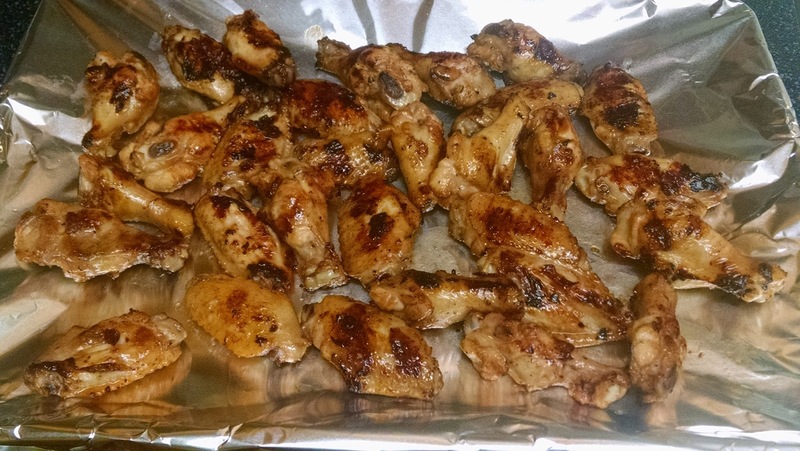 The other option is to make a tester wing if you want to see how they are seasoned as well. If you find that you have finished your wings before you are ready to serve and want to keep them warm, put them in the oven at 200 degrees until you are ready to serve. Go ahead and cover them with foil to keep the steam and moisture in the wings as well. You might find that this becomes one of your go to dishes for entertaining anytime of the year. You won’t need to even mention sporting to score with these! Can’t wait for you to give these a try! As usual, feel free to email me or comment on the post and let me know what you think. I look forward to hearing from you. Enjoy!